Is dropping out necessarily a bad thing? 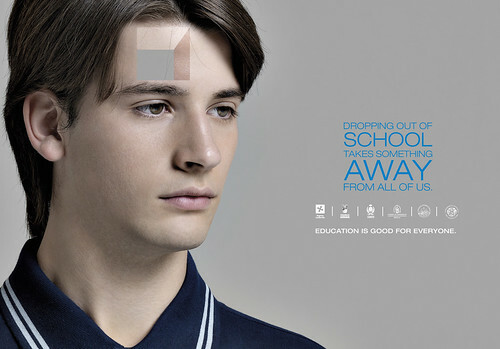 I completely agree that education is important, and as the ad says, it’s good for everyone. (After all, that’s what guided the formation of EducateDeviate.) However, what annoys me about campaigns like these is the false dichtomy that they set up – it’s either school, or nothing. Not everyone thrives, or even survives, in a traditional school setting. Most schools around the world focus on mathematical and verbal intelligence, judging competence through written examinations. There isn’t as much respect or attention given to those who express their intellengences in other ways, such as through the arts or mechanics (see Howard Gardner’s theory on multiple intelligences). For instance, in Malaysia, vocational and trade schools, as well as business and humanities streams, are usually seen as being for “under-achievers” – those who could not score well in exams. Taking up vocations or trades (or indeed, anything that’s not the Pure Sciences) by choice is unheard of, as it does not carry the same prestige as being in the Science stream. Why have we developed this pro-Science-anti-anything-else mentality? Life consists of all sorts of knowledge and experience, and education comes in different forms. Just because someone cannot cope in the cut-throat academic environment of traditional school, and has decided to drop out, does not mean they are automatically a failure in life. It would be better if campaigns like the above didn’t just say “dropping out is EVIL” and actually gave you concrete options for those who can’t cope with normal schooling and feel the need to drop out. Sometimes students are facing immense social issues, such as bullying (see my last entry) and can’t concentrate on education when their peers or teachers are acting against them. Some want to learn something that their school system does not offer, or even learn best in a style not offered by their schools. Some are facing major personal and family issues, such as poverty or ill-health, and need to prioritize those above school work. In the same vein, campaigns that encourage high schoolers (especially those from at-risk backgrounds) to aim for college need to be carefully examined to make sure they don’t make college the only option. While those programs certainly mean well, and are needed to show that college is an option for anyone (not just for a select few), my concern is that they unnecessarily stigmatize those that can’t, or have made the choice not to attend college. Not having a college degree does not doom you to a life of failure. Many of the above options apply at the college level – personal and alternative education, taking a break (one big reason some students don’t thrive at college is because they aren’t prepared enough and just need some transition time), getting involved in the real world. As I’ve mentioned earlier, while college is certainly a form of education, it isn’t the only one. The macro-reason for campaigns like these is that the world has been set up so that one would find it hard to move forward without some level of formal education. But is that fair? Should people be denied employment, sustenance, or personal development just because their education and life experiences are uncertified? Doesn’t this create a stigma against non-academics who have opted to learn from experience (or are forced to by life circumstance)? In some places of the world, valuable educational experience is set at a very high premium, causing elitism and class divides – people can’t afford university, so they can’t get the paper that would help them earn more money to help them get into higher education. It’s a vicious cycle. A better solution, then, is to widen the scope of education to include all forms of learning – academic, vocational, humanistic, holistic, and so on – and create pathways for people to get involved in life and their community, welcoming all forms of learning. Everyone’s educated in their own way, and we all need each other. Telling them that if they opt out of one form of education, they won’t succeed in life at all, is misguided and unhelpful. This is an argument that I often receive when debating the merit of applying to a university solely based on their prestige or ranking. Ming, sorry, I don’t mean to pick on you, but you’ve articulated the argument very well. If getting treatment from the best oncologist in the world is within the means for a cancer patient, chances are she will do so. Besides the obvious, that education is nothing like medicine, there are a few reasons why statements like that don’t stand when it comes to choosing a university, or choosing your educational direction in general. 1. You don’t go to see an oncologist if you’re having problems with your foot, or if you’re feeling fine. Similarly, not every university is suited for everyone. Harvard is often the standard for “top university”, but you wouldn’t be happy at Harvard if you prefer smaller classrooms and you’re very artistic and rather hippie-ish. As far as I know, Harvard doesn’t have a great creative arts/creative industries faculty. To use a statement now stressed by many college counselors and university faculty everywhere, university is a MATCH, not a TROPHY. You should be aiming for the school that best matches your needs, ideals, and personality – even if it turns out to be an obscure school in the middle of nowhere. 2. There isn’t a single “best oncologist”; no one doctor holds the monopoly on quality. Just because XYZ Doctor managed to hold the top post, doesn’t mean all the other doctors below him are crap. Similarly, just because XYZ University did not rate very high on the rankings, does not mean they’re terrible and are not worth a look. There are many brilliant universities (and doctors) out there, particularly in regions like Western Europe, Scandinavia, Africa, South America, New Zealand/rest of Oceania, and other places that just don’t figure into traditional ranks. It is really stupid to think that only a handful of universities are able to provide a top-notch learning environment. 3. Best according to who? Rankings, despite looking objective, are actually rather subjective – it all depends on how the ranking body decides to calculate their criteria. How would you put into numbers something like “satisfaction of student body” or “best match for your needs”? The U.S. News, which is generally the “gold standard” for US university rankings, have come under fire for putting in false information for colleges that refuse to participate in the rankings. So are the rankings necessarily reliable? Not when you have a growing backlash of colleges against it. It’s not just America either; there has been criticism over the UK’s Times Higher Education List, as well as Canada’s Maclean’s list. 4. How honest is the oncologist? It’s not just the rankings body that messes up numbers; some universities are also cheating at the game. There is a major lack of transparency on both sides about how the numbers are calculated and calibrated. There is no way for us to know that the numbers are at all accurate or representative, so why rely on them as your main – or only – source of information. It would be far better to do more research on each university individually, getting information straight from the source, and making up your own minds based on your own needs. 5. Everything happens in context. You may have found the best oncologist, but what if they live too far away? Or they’re booked up for months? Or if they’re too expensive for your budget? Similarly, there are many other considerations to make when choosing a university. Where are they located – is it an atmosphere you enjoy, is the weather good, can you afford to live there? How about the student body – how homogenized (or not) are they? Is it small or big? Are the classes heavy on theory, or are they more practical? Does the school expect you to do an internship or semester abroad as part of the course? Does one course differ from another in style? There are many aspects that make up the learning process of a university, and are things that aren’t necessarily reflected well in rankings. 6. Can you afford it? Another argument that is usually made for going to a “top university” is that they supposedly give you a lot of funding, so you can afford to go. Never mind their extreme selectiveness; it is extremely difficult to get funding for studies, particularly if you’re an international student. In many countries, international students are expected to pay full-fee, and scholarships are highly limited. FAFSA, which is the US Government’s way of working out financial aid, is not applicable to international students. The world of financial aid is mysterious and complex, especially if you’re a “high-ranking” university – funding resources are limited and not all of them can afford to (or want to) support students that can’t pay full fee. Interestingly, there are a growing number of smaller-scale universities that are open and willing to give full financial support – they are often more attuned to student welfare (treating the students as individuals with needs and desires) and don’t have to deal with too much internal competition. Looking for a good university or college? Don’t put too much stock on ratings. Do your own research, and you’re more likely to find the choice that’s best for you – and save a lot of money, time, effort, and heartache.